I went home last weekend. I needed to do some work in my garden and I needed to make sure Uncle Bob was “ok.” On Saturday morning, I loaded up the Jeep in my usual way and left The Coop just a little later than my usual pre-dawn time. My first stop at home was the Lisbon Community Credit Federal Credit Union; who should be getting into her car but Uncle Bob’s Florence Nightingale. I was so happy to see her and thank her for taking Uncle Bob to the doctor’s following his lumbering accident, I practically jumped out of my moving car to hug her. I got all the gory details and then I went into the bank with the weekly Class of 1982’s reunion deposit. “Hello, Ricky,” I said to one of my class mates. He sat behind me in Chemistry my junior year and now he’s a loan officer at the credit union. My business complete, I drove five miles to my parent’s house and told my mother the whole story. We laughed and I said “Mom, you just can’t make this stuff up.” I know it’s a cliché, but it’s true. This is my life when I’m in Lisbon Falls. I love that place; it’s my home. When I was in high school, Bruce Springsteen was riding a swelling wave of popularity. I listened to Born to Run during middle school and The River in high school. One of my classmates loved “The Boss;” I owned all the available Springsteen vinyl, including his debut album, Greetings from Asbury Park, NJ. I don’t know how, but I ended up in an American Literature class with my older brother and his friends and occasionally, one of them would use a lyric from a song to counter a line by Nathaniel Hawthorne or William Faulkner. Like most post-industrial teens, I went to college, got a “liberal arts” degree, and started working in the business of business. It’s not important to know what I’ve done all these years; I might as well be pecking at blue and red paper squares, writing my letters with lots of unread words and legal language. In my years of inching further away from home, I thought I was achieving a certain level of success. Boston is not the end of the world, but I have spent a lot of time there in the last decade of my life. I’ve had time to think on my solitary dusk walks from North Station over Beacon Hill and through the Public Gardens. Crossing Arlington Street and taking a right onto Newbury Street, I’d always check my watch to make sure I got to the Junior League Headquarters on time for every 6:30 p.m. meeting. I learned a lot of things in my quest to hide my second-generation American blue-collar roots and I owe a debt to a handful of passionate Junior League members who helped me to see myself more clearly. One or two of these gems understood what it meant to serve others and they showed me by example as they volunteered tirelessly year after year. The first General Membership Meeting of the 2012 – 2013 Junior League year was held this past Monday night and I was supposed to go. One of my gem-friends was presenting important information and there was also an agenda item about the Show House. I’m sure the meeting was sparkling and well-attended; I’ve been to enough of these gatherings to know the first General Membership Meeting of the year is always fun and exciting. For the first time since 2001, I didn’t make the trip south; instead, I headed north. 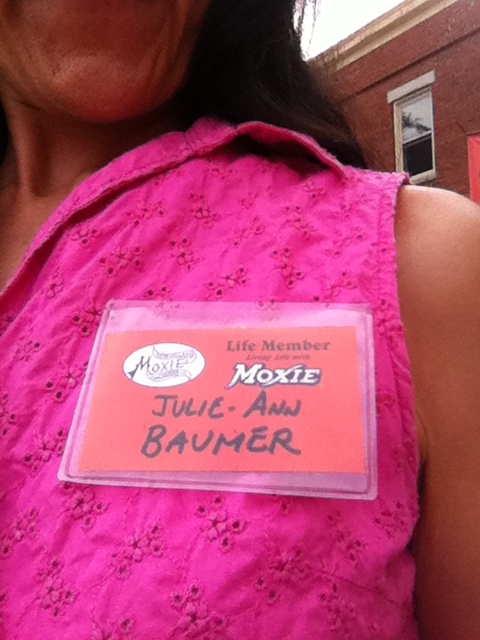 The New England Moxie Congress asked me to represent them at a public hearing at home regarding the 2013 Moxie Festival. It was an interesting meeting and some of my classmates were there. I knew almost all of the 50 people in the Town Council chambers at the Lisbon Town Hall. The Moxie Festival is a large undertaking for a small town like Lisbon; it takes a lot of people putting their shoulders to the wheel together to push it forward and make it successful. Some people had gripes, some shared helpful history, and others offered thoughtful suggestions. I stuck my hand up and volunteered to serve; after all, I was wearing my Junior League charm bracelet. This entry was posted in Home and tagged Bruce Springsteen, Frank Anicetti, Jim Baumer, Lisbon, Lisbon Community Federal Credit Union, Lisbon High School, The Junior League of Boston, The New England Moxie Congress. Bookmark the permalink.